There can be little doubt about the fact that rugs of all types have always served as more than just everyday functional workhorses and decorative embellishments. Reaching back to the very origins of weaving itself, it is clear that rugs have had the ability to reshape everything from nomadic lifestyles to civilization at large. 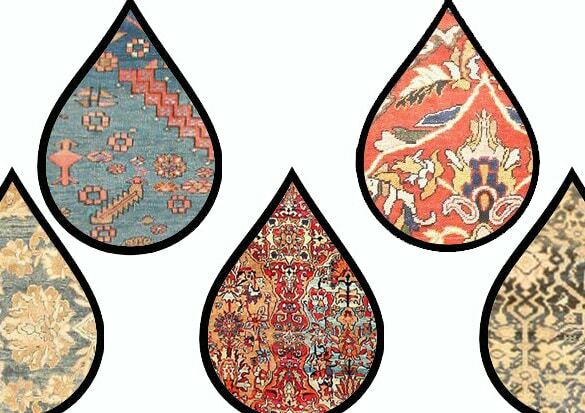 Rugs Rugs and More Rugs – Its Raining Rugs !!! Rugs not only meet some of the most basic human needs within the home, they have long contributed to the evolution of society as it has come to be known. It really does bear repeating that rugs have long reached well beyond the utilitarian realm to facilitate much more expansive ends. From the dramatic impact of weaving’s genesis on nomadic peoples to eventual nourishment of entire segments of civilization, the emergence of rugs, on a large scale, is a noteworthy historical occurrence. 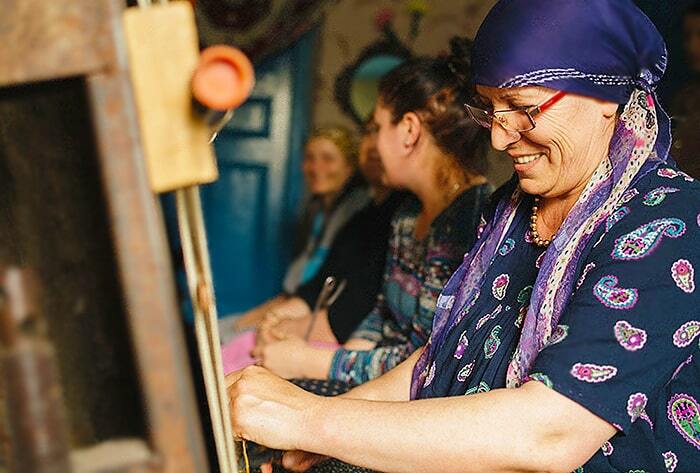 Even the most remote village could garner plaudits and attract merchants from all corners of the globe by developing a strong rug weaving tradition. Trade routes stretching from Asia to Europe would serve as conduits for these sought after textile art creations. In short order, rug weaving evolved into a real art form and made its way into every strata of society, from the modest all the way up to the royal. Also of note is the fact that rug making served as an invaluable mode of expression and consciousness for their creators, the majority of whom were female weavers. This was true even in the male dominated patriarchal world in which they lived. Rugs represented perhaps the only form of free female expression and women’s liberation in an era otherwise devoid of such outlets. Across the ancient Oriental world, rugs played a substantial role in religious practices. Whether those be the prayer rugs such as the Persian and Turkish rugs favored by adherents of Islam to the Khotan rugs used by monks rooted in the practice of Buddhism. 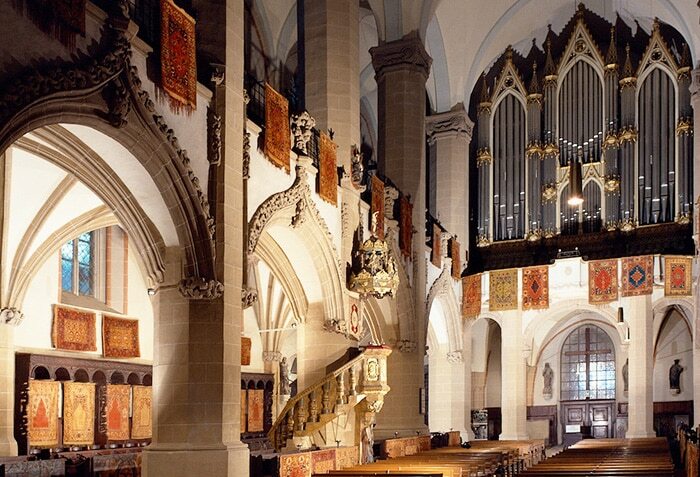 Christian believers also placed great importance on antique rugs, as they have always been widely used in Protestant houses of worship and presented ceremoniously to leading officials in the church. The world’s love affair with finely woven rugs has endured for centuries, but has also gained new steam in the past century. Rugs can now be found in the worlds of fine art as well as high fashion and interior design. Vintage mid century rugs have gained the admiration of interior design professionals everywhere, and they are also coveted by discriminating rug collectors the world over. It is indisputable that vintage and antique rugs are interwoven in just about everyone’s daily existence and are properly considered part of a broader lifestyle. Rugs have contributed greatly to the development of innovative design and unorthodox thinking. When it comes to the history of woven arts, 1949 is properly considered to be a watershed year. This is when a Russian archaeologist by the name of Sergei Rudenko was scouring the Pazyryk Valley in Siberia, ultimately leading to the discovery of the tomb of a true Prince of Scythia. Within the tomb was an array of treasure that was undisturbed for more than 2500 years. 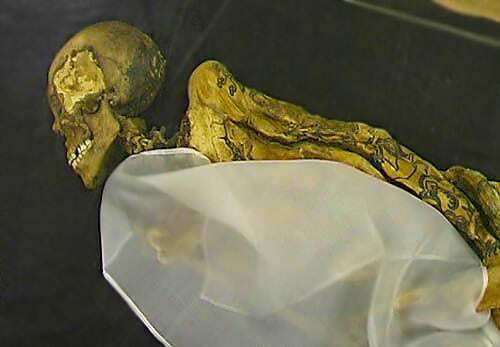 A number of intriguing items were found therein, including devotional and decorative figures, saddles of cloth, cannabis seeds and inhalation paraphernalia, a large burial chariot and tattooed mummies, all of which offered a fascinating glimpse into the lives of Pazyryk’s nomads. However, this was not all that Rudenko revealed, as there was also a rug. The rug found in the tomb had been frozen for centuries, keeping it incredibly well preserved. 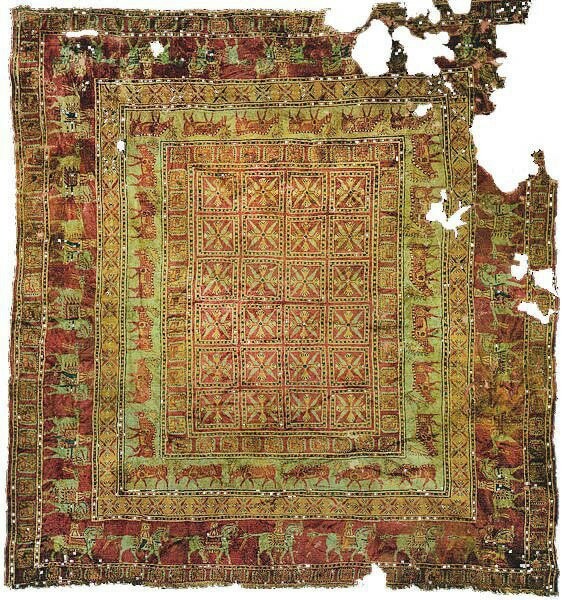 It is in fact this Pazyryk pile rug is the oldest example known to man. Its incredible state of preservation and unrivaled distinctiveness has provided no limit of excitement to art historians, textile specialists and carpet weavers of all types. The story of this rug serves to show how crucial it and others like it have always been even to the earliest civilizations. 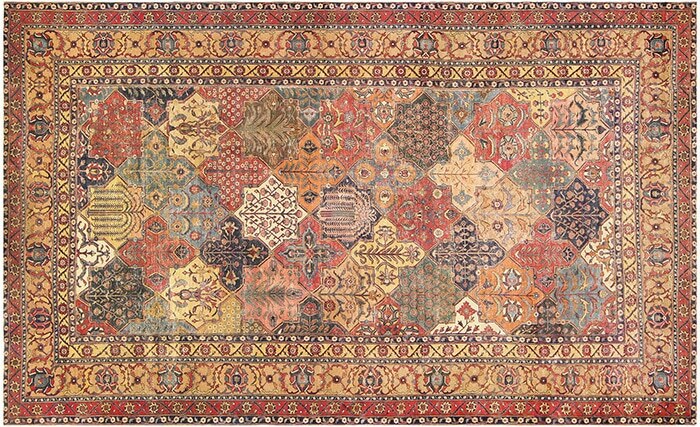 It is know understood that the Pazyryk carpet can be dated to roughly 400 B.C., a time period that is contemporaneous with the earliest discovered written mention of Persian rugs. Textiles of this sort were first discussed by Xenophon of Greece in the work Anabasis which dates to about 370 BC. In the 3rd chapter of the 7th book, a reference is made to Timasion having presented an especially worthy person with a silver bowl and a “carpet worth ten minas.” The rug was discussed as being a valuable luxury item meant to be presented in the course of diplomacy. 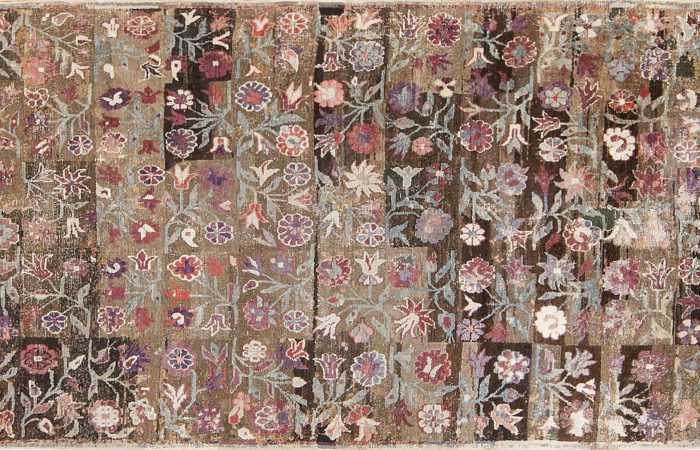 Though it remains unclear whether the rug at issue was flat woven kilim or one characterized by wool pile, or indeed whether embroidery or other techniques were used in its production, it is certain that the initial mention of Persian rugs occurs firmly in a context of status and privilege. 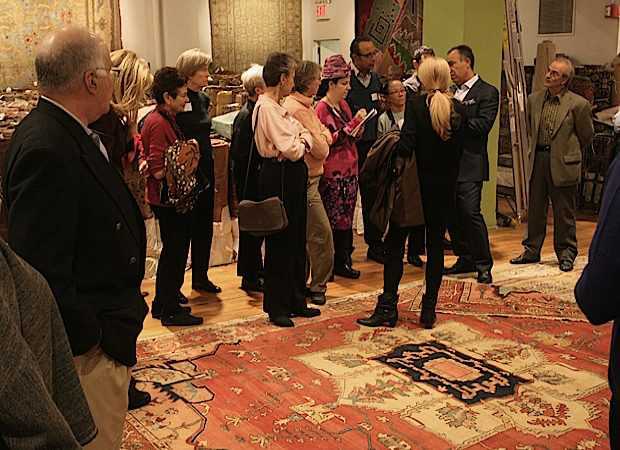 By the early part of the 16th century, rugs of Persian origin assumed a role far more expansive than that of fancy items used to navigate diplomatic minefields or of utility items for nomads. Rather, they were transformed into a vital tool of statecraft by Shah Abbas. This happened when he launched an initiative to restructure the economy of his region by drawing merchants from Europe to visit. A key component of this was the modernization of textile production and facilitation of exports to the West of pile type rugs. 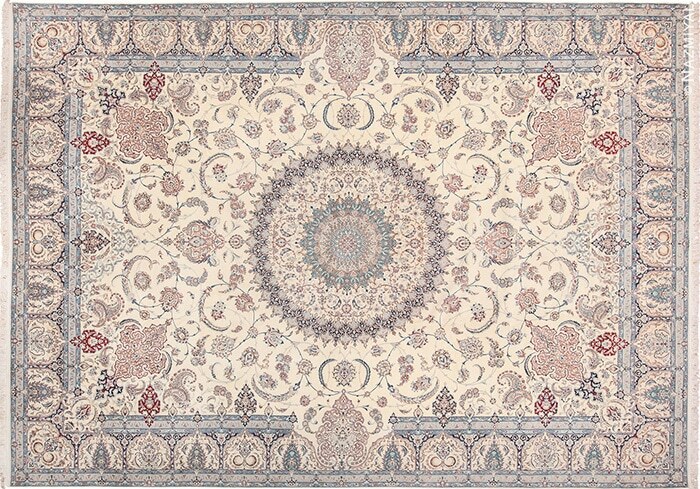 The Persian style of rug, whether hailing from Tabriz, Khorassan, Isfahan or Kerman, have long been known for high quality wool, goat and camel hair, cotton and silk, with each fiber type chosen for specific reasons and uses. Natural carpet dyes have been the standard of excellence characteristic of these rugs, and still today they are mostly made from animal and plant extracts. 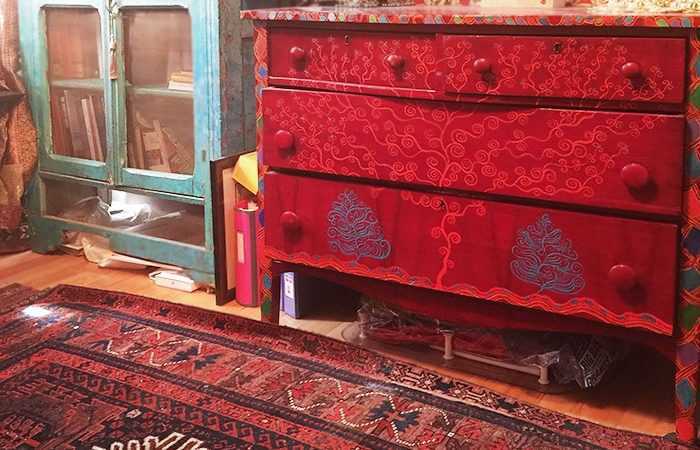 Because Persian rugs were clearly the product of a great deal of creativity and craftsmanship, it is not surprising that they became beloved the world over. Further, because religion was such a pillar of society in this part of the globe, it inevitably found expression in weaving, with distinctive prayer rugs soon taking center stage. It is now the case that those who own antique or vintage rugs are thought to have attained a particular level of societal status indicative of a very appealing lifestyle. Rugs of this sort are symbols of discerning taste as well as impressive financial status, as fine rug weaving tend to come at a price. The truth is, though, that purchasing a rug in this realm is money well spent. Antique rugs are timeless in their beauty, are extremely durable and fit well in a range of decorative styles, whether traditional, mid-century modern and more. Even minimalist interior design spaces can benefit from the anchoring abilities of a fine Persian or antique rug. Early 20th century modernist design marked a real shift from the tastes and traditions of the Victorian age. Moving away from strict social strata and class division, the modern era put the spotlight on the effectiveness of simple lines, the beauty of geometry and the impressive impact that the deliberate use of color can have. Adherents of this movement engaged in daring experiments with pattern, shape and texture in a number of interesting ways. Excess and intricacy were substituted with a novel way of viewing the world. However, even in the midst of this sort of design sea change, traditional rugs continued to hold their place of importance. It seems counter intuitive, but despite changing tastes in almost every other aspect of design, antique rugs retained their ability to provide essential grounding to rooms of all types. 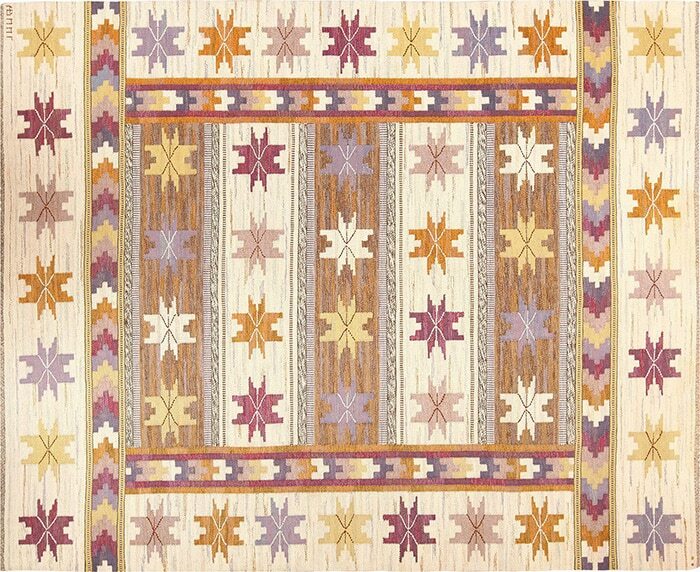 Whether rendered in a folk art style or an abstract geometric, there is a rug to suit every space conceivable. 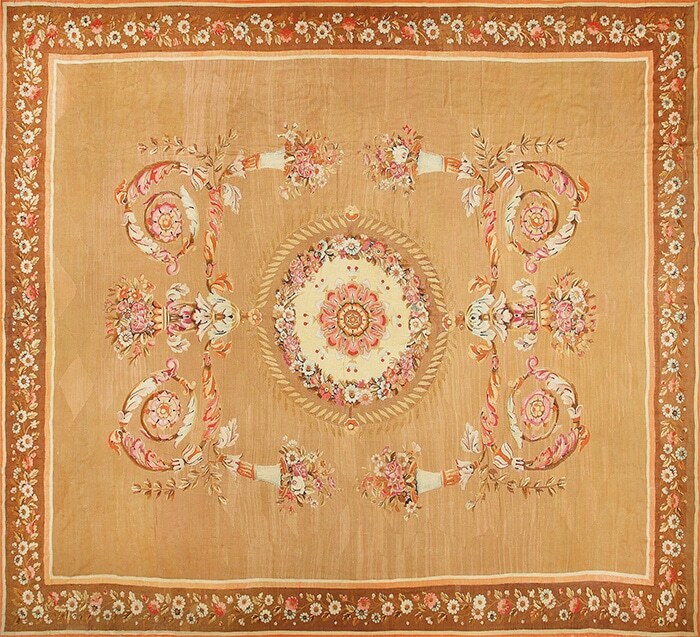 An impressive aspect of antique and vintage rugs is their status as environmentally friendly art. Their painstaking creation already occurred and therefore they do not leave a new carbon footprint. The use of natural dyes and textiles makes carpets of this type something that transcends time, space and societal preferences. They represent a firm nod to quality and tradition in an age that is all too often overrun with mass produced goods of inferior quality. Swedish rugs in particular, but Scandinavian carpets generally are among the most significant categories of coveted vintage mid century textile art. Connoisseurs from all over the world appreciate the vivid colors and impressive weaving styles used in Scandinavian rugs. Further, they work brilliantly with a range of contemporary interior design styles. Their interpretation of regional landscapes, histories and ways of thinking are universally appealing, with nature always taking center stage, albeit in a more symbolic way than in the past. At the heart of Scandinavian rug making is an overarching dream of equality in society. The fundamental idea is that everyone in society, not just the powerful and wealthy, should have the ability to obtain a visually pleasing and functional interior space. As such, Swedish rugs incorporate beauty, utility and affordability in a remarkable way. Perhaps the most influential doyenne of this school of rug making was Marta Maas Fjetterstrom, who founded her own firm in 1919. Following her passing in 1942, the company’s direction was taken over by Barbro Nilsson. Some other key names in 20th century Swedish rug making include Marin Hemmingson, Ingrid Dessau, Brita Grahn, Sigvard Bernadotte, Viola Grasten and Edna Martin. Each and every one of these innovators brought a unique thread to the overall history of Scandinavian design and weaving, an art form that continues to constantly attract more and more devotees. Contemporary design mavens adore the shapes, patterns and complementary coloring of these rugs, as well as their themes that are often drawn from regional folk tales and folk lore. When it comes to the most beloved vintage rug styles, few compare to those that hail from Morocco. Their originality and charm are unrivaled, as they are frequently festooned with tribal figures and patterns indicative of North African traditions. Rugs from this school are storytellers in and of themselves, with symbolism taking the place of words. The creation of every part of a Moroccan rug is deliberate, with meaning woven throughout every inch. Omens and blessings are contained in these styles, providing an opportunity for female rug weavers to express themselves to the world. Leaders of the Modernist movement during the middle of the 20th century were particularly fond of Moroccan examples of rug making artistry, using them often in the spaces they created. While there are different types of Moroccan rugs, the Moroccan Beni Ourain rugs, specifically, were especially prized, perhaps because of the way in which they stand apart from other types of Moroccan carpets. 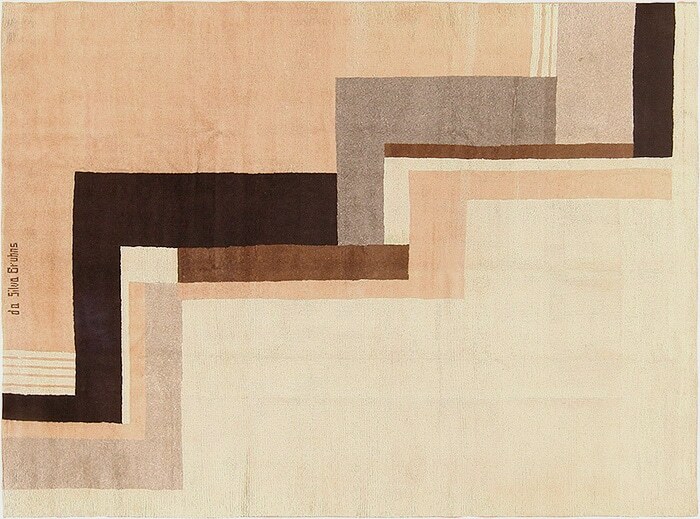 These rugs are mostly dichromatic, made of beige fields with apparently randomized patterns rendered in charcoal and brown hues. Their shaggy rug piles are delightful underfoot. Copies of this style are produced in large numbers by factories nowadays, because the demand for them is so great. 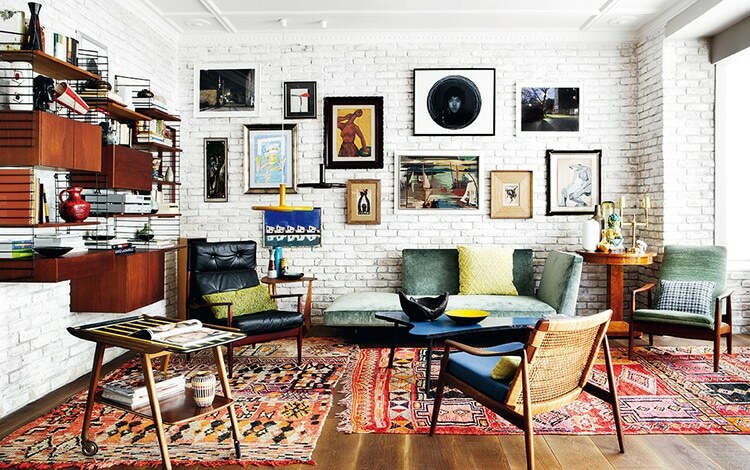 Rugs of this sort are seen as having greatly impacted designers including Vladimir Boberman and Ivan Da Silva. Some of the most evocative interior spaces of the 30’s and 40’s were designed by Frances Elkins, with these rugs playing a crucial role. Toward the end of the 19th century, taste makers in England had grown weary of mass produced items that were lagging in quality. In addition, tastes began to shift away from gaudy, ornate Victorian trimmings. Reform was in the air, and this extended to the way society would start thinking about the world and the things made in it. The realm of rug making was not immune to these changes, something evidenced by the emergence of the Arts and Crafts school of thought. William Morris, Gavin Morton and Charles Voysey brought an entirely new take to the naturalistic themes of earlier carpets. Rather than using intricate detailed botanical forms of the past, these designers gravitated toward more geometric displays that were more tribal, larger scale and open in feel. Traditional blue and reds from Persian schools were replaced by earthier colors more likely to be found in a European garden. Pastel shades also played a role in the patterning of these rugs, allowing them to lend an air of peacefulness to the interiors they adorned. 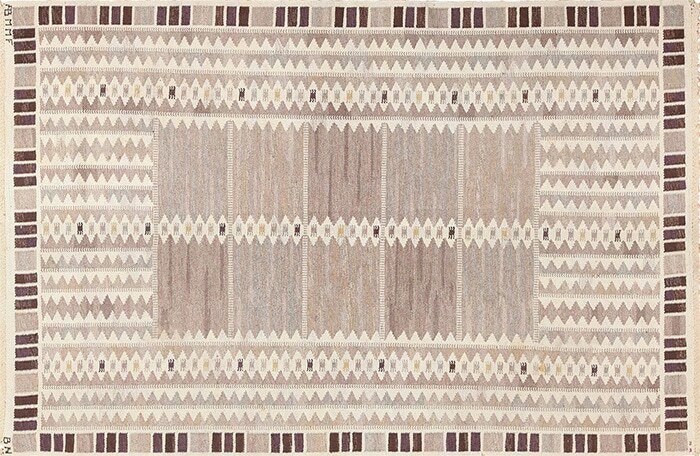 Woven with high-quality wool and time tested methods, these rugs remained loyal to the techniques and traditions of rug making across the centuries, yet they also brought a new spin all their own. In recent years, the themes and standards of antique rug creation have transitioned successfully into the world of fashion. This trend extends far beyond the “one off” creations of a home seamstress, with vintage rug themes having made their way onto runways and closets of taste makers everywhere. The timeless nature of these patterns and textiles is something that fashion mavens simply cannot ignore. The natural dyes, vivid jewel tone colors, impressive patterning and high degree of craftsmanship have broad appeal, and their popularity in the fashion world should really come as no surprise. Some of the best-known names in modern fashion have taken notice of the rug making art form, putting it to use in their collections. Burberry, for instance, used carpet influenced fabrics to create a series of capes for its 2014 winter line. 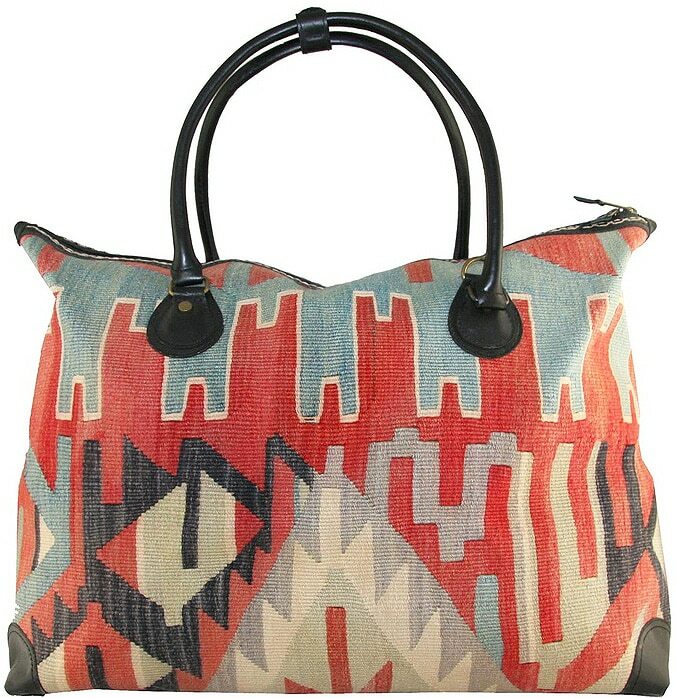 Kilim inspired bags also took the fashion world by storm, gaining massive popularity among both male and female shoppers. This is a true testament to the timeless qualities embodied in antique rugs. 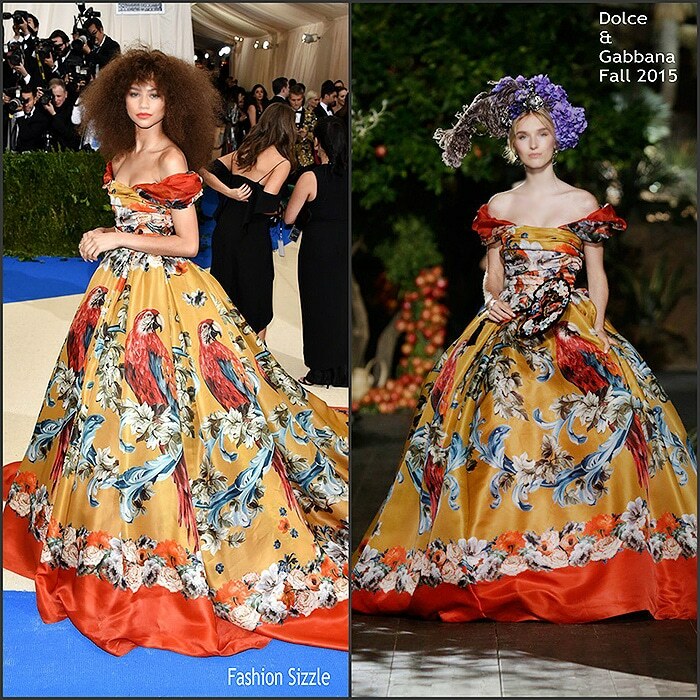 Further, the 2014-15 collections of Dolce & Gabbana utilized French carpet patterns and themes to create a truly stunning line reminiscent of Savonnerie and Aubusson rugs. Embroidery, baroque floras and high quality textiles made this line a real standout in the fashion world during that period. Fashionistas with a more bohemian vibe can also take advantage of rug making traditions when it comes to what they wear. Kilim patterns, again, play a substantial role in this fashion trend, which has flourished from the 1970’s onward. Tribal patterns from India, Africa and elsewhere are frequently used in the creation of coats, dresses, ponchos, bags and more, appealing to free-wheeling, artistic individuals everywhere. 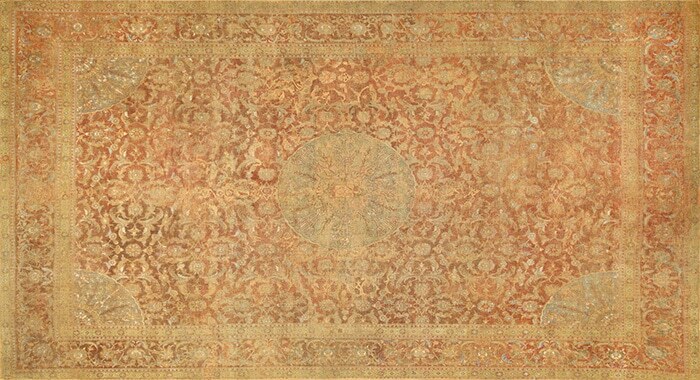 It is impossible to dispute the power of antique rugs to bring a sense of grounding, warmth, vibrancy and interest to any interior space. Rugs serve to establish conversation spaces for loved ones, create personal refuges for families and bring light and life to the home. Vintage Persian rugs, in addition to other rug types, fit seamlessly into a dizzying array of design styles, including Mid-Century Modern, Bohemian, traditional, Victorian, Scandinavian and even Regency. 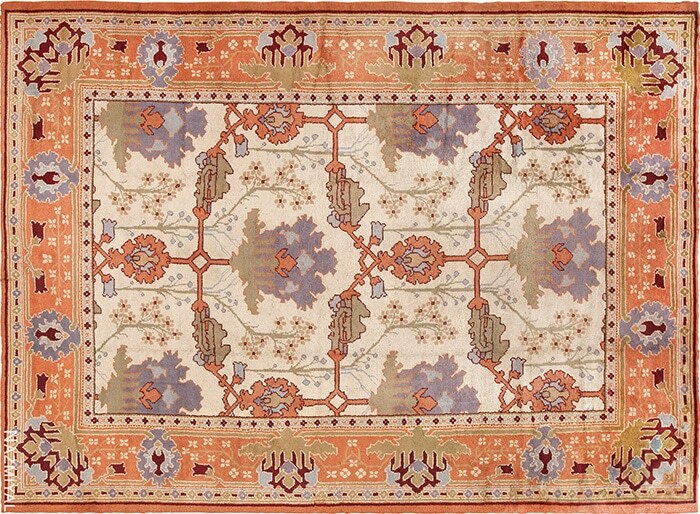 Even a rug that dates back centuries has relevance and of-the-moment appeal. There truly is no end in sight to the popularity, functionality and desirability of antique and vintage rugs.